This 5 day exam is the first rung on the BASI ladder and is something of a right of passage for all would-be ski instructors. As it is usually the first experience that people have with BASI emotions and anxieties can run high largely due to the unknown nature of the exam. But what does it actually involve and what is it like to do? With help from some of this years students we will try mythbusting the BASI 1 so you know what to expect. Continual Assessment: BASI refer to the exams as ‘courses’ which tells you something about the style of assessment. It is both a training an examination – meaning that you are expected to improve throughout the course. The aim is to be at the required level to pass by the end of the course. So don’t worry if you are not meeting all of the criteria at the start of the week – your BASI trainer will help you improve and push to get you to the level by the end. Resits: If you do are not considered to be at the level by the end of the week then you will be able to resit the exam. Separation of Tech and Teach: The exam is market separately for Teaching and Technical ability and you can pass one but not the other element. If this is the case you will only be asked to resit the element which you failed and not do the entire exam again. 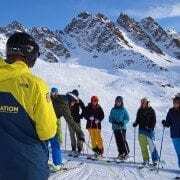 Our Courchevel students have just achieved 10 out of 10 pass rate on their BASI Level 1! They told us what was easier than expected, what they found most challenging and what they wish they had known. Different Feedback styles: Some students found it hard being given feedback in a different style from their BASI trainer than their coaches and mentors before the exam. It is an inevitable part of human nature that we all have slightly different communication styles. This includes ways of wording and presenting our feedback. While we purposefully give each of our groups a number of different trainers to help people get used to different styles, be prepared and open minded when you start your exam so that the individual style of the BASI trainer does not throw you. Mental Energy: Another thing that our trainees were surprised by was how mentally tiring the exam was. While the assessment is a physical one which sees you skiing everyday, it takes lots of mental energy to focus on feedback and the theory throughout the week. Especially given the work doesn’t finish when you take off your skis! There are evening theory sessions to take on as well. Do what you can to help yourself with this. Get plenty of sleep, eat well and if possible go into the exam well-rested too. Before you are put off for good (!) our Courchevel team were also surprised by how much easier some of the things they had worried about were. In particular the exam was more relaxed and enjoyable than expected. It is easy to panic before any assessment but try not to let memories of silent, tense exam halls make you more nervous than you need to be. There is plenty of time for laughs and chat during your assessment! You might even find you enjoy the coaching and learn lots while you are doing it. The theory was a pleasant surprise to our students too. Get your head around it before the exam and make sure you have done your prep and revision. This means that come exam time, you might be pleasantly surprised to find out you already knew more than you thought. Some students also found the teaching easier than they had expected. Try not to get too bogged down fear of speaking in front of the group. Remember – good eye contact and a big smile goes a long way! Some would try to focus on mastering one thing at a time. Correcting one thing before moving on to focus on the next makes the process seem less overwhelming. Their final piece of advice was that they would worry less and enjoy it more! Remember the trainer is there to help you improve and their points are constructive not critical no matter what your level. A great note to end on we think. So if you are about to head into your BASI 1 Exam and are letting nerves get the better of you bear this in mind… and good luck!